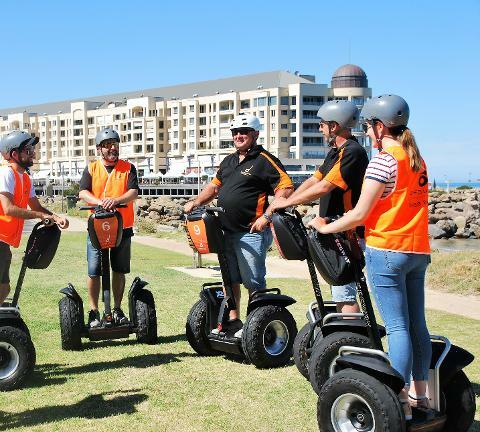 Learn your Segway skills on the grassed area at Moseley Square Glenelg. 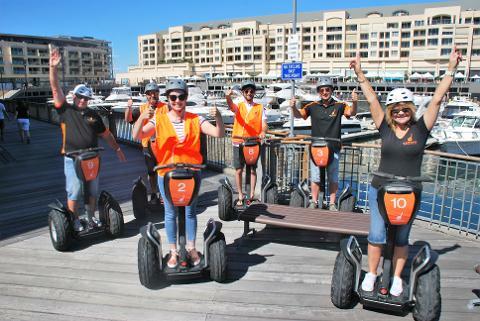 Once trained we head off on a 6km trail taking in major attractions including the Stunning Glenelg Beach foreshore, Moseley Square, Glenelg Jetty and Patawolonga Marina. 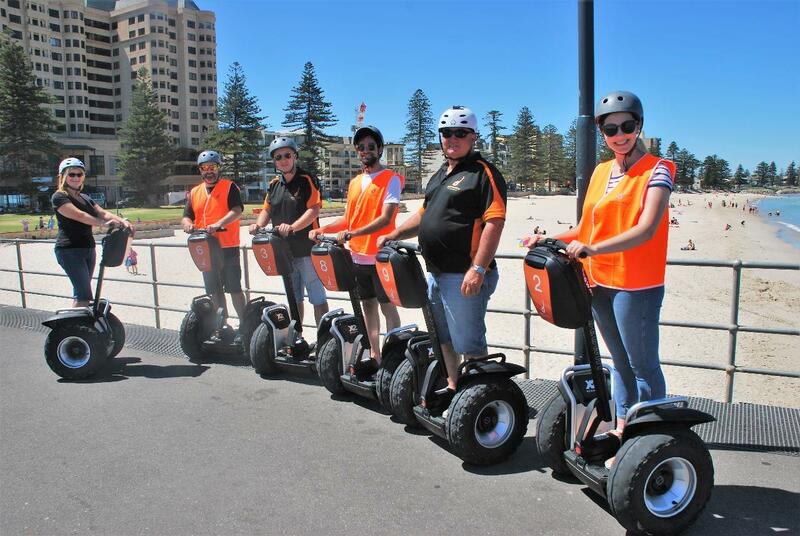 Enjoy an adventure unique to Adelaide and Segway Sensation SA as you ride your Segways on the Beautiful Glenelg Beach whilst soaking up the ambiance of the pristine beach location. Turn heads as you glide past the many beautiful sights and attractions located at our premier beach location. 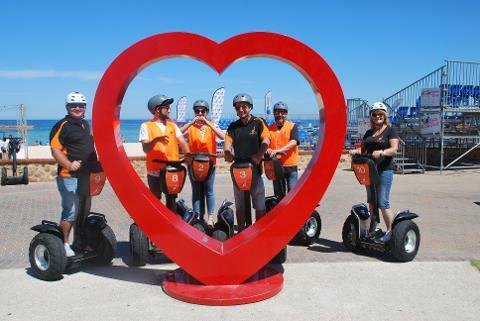 Please note - weight restrictions apply to all Segway tours. Please see Booking and Tour Terms and Conditions for further information. Our experienced guides will provide you with full training, then it’s off to explore the vineyard on two wheels. Before you know it you’ll be gliding effortlessly through the grapevines! 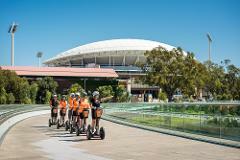 All bookings for Segway Sensation SA services are subject to the following conditions. Please read these carefully prior to making a booking. In the event of rain our tours will still operate. Segways are not affected by rain and according to our customers the puddles and bit of slush actually enhance the experience. We encourage all guests to dress weather-appropriately, and we can also provide complimentary rain ponchos. In the event that we are not able to provide the activity due to persistent rain, guests will be provided with a credit which they may use for a tour at another date of their choosing. We understand that sometimes – even with the best of intentions – the best laid plans go awry. However from the time that you make your booking with us, we commit your places and hold them for you. This means that should someone else want to go on the tour you are booked on, we may not be able to take that person or people on the tour. We ask you to please understand that, should you cancel your tour, you may be charged a cancellation fee. – Cancellations received more than 14 days prior to the tour date will receive a full refund of the tour fee. – Cancellations received between 6 & 14 days prior to tour date will incur a cancellation fee of 50% of full tour cost. – Cancellations received within 5 days prior to tour date will incur a full cost of tour cancellation fee. – Please also note that failure to arrive for a scheduled tour will incur a full cost of tour fee and refunds will not be given for any part of a package or tour after the passenger has commenced the tour. – Please note also that a “cancellation” includes a change to the date of a tour booking that requires the original booking to be cancelled. It is unlikely that we will have to make any changes to your booking after it has been confirmed. However, occasionally some changes have to be made. In the event that we need to cancel or amend your booking, we will notify you as soon as practicable and offer you the opportunity to cancel and receive a full refund. In all cases our liability is limited to the amount of payment received by us. We cannot accept responsibility, or pay compensation, where we have to cancel a tour due to any unforeseen or unavoidable event beyond our control. Participants must weigh between 40 kg and 120 kg as recommended by the manufacturer of the Segway PT, Segway Inc.
Riders are not to be under the influence of drugs/alcohol exceeding .05. Participants will be breath tested prior to the event. All participants will be required to sign a Disclaimer Form. The form includes but is not limited to the statements that the participant has read and understood their obligations and participates at their own risk. All participants under the age of 18 MUST be accompanied by a parent or guardian and the parent or guardian must sign the forms. Segway Sensation SA reserve the right to prohibit any participant, prior to commencement, during training or during the tour from participating in our Segway Tours, if they fail to meet the Rider Requirements or do not maintain, at the tour guide’s discretion, acceptable behaviour, as specified in these terms and conditions. In such cases, no refunds or alternative dates will be given.